It's true...we're having a baby! : 37 weeks and 6 days! 37 weeks and 6 days! 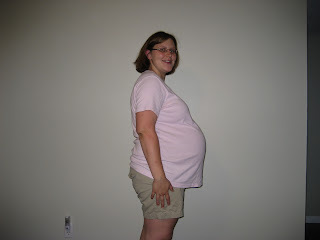 i just took this pic today, at 37 weeks and 6 days. so flattering, huh? it is hard for me to believe that the due date is only a couple weeks away. it is very surreal. i asked dave sunday afternoon if he knew what was about to happen to our lives. he said an a-bomb is about to hit us. nice. that's kind of a good way to put into words how i'm feeling. :) i think that we've been so focused on remodeling and getting as much done as possible that we haven't been mentally preparing ourselves to become parents very much. of course i'm not sure that we can actually do that anyways, so i suppose it's good we're just keeping busy and not stressing out. last night we had our 38 week checkup with the midwife. my blood pressure was lower than it has been for months, so that was a blessing. i was praying that it wouldn't be high again. the midwife commented on how cheerful and joyful i am, more than when she first met me. i think that i'm just really excited that we're actually starting our family now and i'm feeling at peace with what i'm going to have to do to have a home birth, etc...we heard the baby's heartbeat again. the midwife said the baby is in LOA (left occiput anterior) position which the other midwife said Saturday is one of the most ideal positions for birth (basically it's head is down...way, way down according to the midwife, she was pretty surprised again...and the rear end is on my left side and the feet are on my right side). they also said i have lots of amniotic fluid and that the baby is "good-sized". i'm trying not to dwell on that "good-sized" thing. ugh. or i might just stop eating for the rest of the pregnancy, which probably wouldn't be good. i have been pretty emotional lately. crying at the drop of a hat. ugh. sometimes i even laugh at myself while i'm crying. it's craziness. just uncontrollable. we have taken walks the past 2 nights. i regret that i haven't been more active this whole time but at least i'm doing something here at the end. i'm feeling very huge these days. i never realized how challenging or near impossible it would be to do certain things with a stomach this size. trimming my toe nails and especially painting them myself is out of the question. that's now dave's job (as if he doesn't have enough to do, right? ), putting on pants is a huge challenge and picking anything up off the floor is hard too. i'm looking forward to meeting the baby and being able to do this mundane stuff again for myself with ease. our friend nick guesses the baby will be born july 19th since that's his bday. and our mom's guess the night of the full moon (the 25th/26th). so do any of you have any guesses? July 27th, I don't know why, just because! You look pregnant and awesome! Don't worry about the "good size". Docs/Midwives can never fully tell how big the baby will actually be. I was told Molly was going to be a petite little thing and she was almost 8lbs (1 oz shy) and she was a week EARLY! My friends doc told her that her son was going to weight close to 9lbs and he was a big baby...he was 6lbs 8oz when he was born! LOL It's really all a guessing game. I think the baby will be 7lbs 8oz, 21 inches long and look exactly like Dave--because it's going to be a boy. :) I can't WAIT to see pics and hear when the baby is born..and then visit you!! Cook for you, clean, whatever!!! Okay, I'll bite! I'm going to say July 23! I think the baby is going to be of average size, 7lbs 1oz and 20 inches. Oh, and it's a girl! !